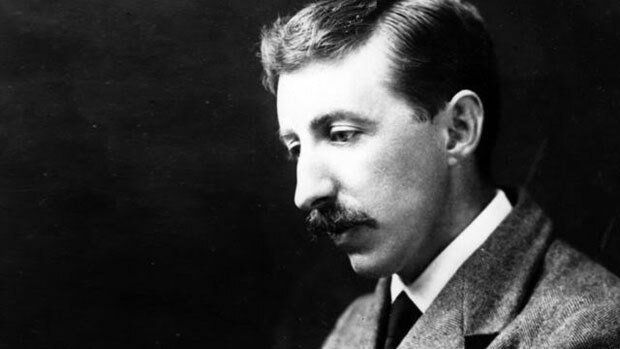 Edward Morgan Forster, better known as E.M. Forster was born today, January 1, in 1879. He was an English novelist, short story writer, essayist and librettist. Many of his novels examined class difference and hypocrisy in early 20th-century British society, notably A Room with a View (1908), Howards End (1910), and A Passage to India (1924), which brought him his greatest success. He was nominated for the Nobel Prize in Literature in 16 different years. Forster was born in London. His name was officially registered as Henry Morgan Forster, but at his baptism he was accidentally named Edward Morgan Forster. In 1883, Forster and his mother moved to Rooksnest, near Stevenage, Hertfordshire after his father's death. This house served as a model for Howards End, because he had fond memories of his childhood there. At King's College, Cambridge, between 1897 and 1901, he became a member of a discussion society known as the Apostles (formally named the Cambridge Conversazione Society). They met in secret, and discussed their work on, and about philosophical and moral questions. Many of its members went on to constitute what came to be known as the Bloomsbury Group, of which Forster was a peripheral member in the 1910s and 1920s. There is a famous recreation of Forster's Cambridge at the beginning of The Longest Journey. The Schlegel sisters of Howards End are based to some degree on Vanessa and Virginia Stephen. After leaving university, he travelled in continental Europe with his mother. They moved to Weybridge, Surrey where he wrote all six of his novels. In 1914, he visited Egypt, Germany and India with the classicist Goldsworthy Lowes Dickinson, by which time he had written all but one of his novels. In the First World War, as a conscientious objector, Forster volunteered for the International Red Cross, and served in Alexandria, Egypt. Forster spent a second spell in India in the early 1920s as the private secretary to Tukojirao III, the Maharajah of Dewas. The Hill of Devi is his non-fictional account of this period. After returning to London from India, he completed his last novel, A Passage to India (1924), for which he won the James Tait Black Memorial Prize for fiction. Forster died of a stroke on June 7, 1970, at the age of 91. Forster had five novels published in his lifetime. Although Maurice (1971) was published shortly after his death, it had been written nearly 60 years earlier. It is a homosexual love story which also returns to matters familiar from Forster's first three novels, such as the suburbs of London in the English home counties, the experience of attending Cambridge, and the wild landscape of Wiltshire. The novel was controversial, given that Forster's homosexuality had not been previously known or widely acknowledged. Today's critics continue to argue over the extent to which Forster's sexuality and personal activities influenced his writing.